Join us Sunday September 24th, 2017 at 2:00 pm (doors open @ 1:30pm) at the Gram Parsons Derry Down (located) @ 297 5th Street NW. Winter Haven 33881. 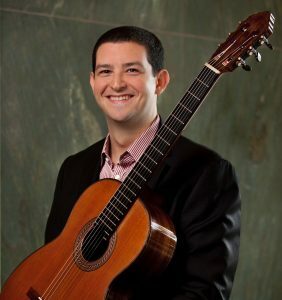 Symphony Guild in partnership with Main Street Winter Haven; presents Classical Guitarist, Benjamin Pila DMA. He has performed extensively through out the United States. He has performed at the 9/11 Memorial Museum as well as for Pope Francis, George W. Bush to name a few. This event is for members only. You can either renew your membership or become a new member.